Here’s a dish fit for a special occasion. Smoky flavors, a rich cherry compote, and a jammy red wine, are perfect for winter holidays. In a skillet over medium heat, melt the duck fat or butter, then add the shallot and stir for about 30 seconds. Add broth, cherries, and Port. Increase heat to high and boil—stirring often—until sauce is reduced to a glaze, about 3 minutes. Whisk in 1 tablespoon cold butter. Add 2 drops of stevia, taste, and add more if needed. Season to taste with salt and pepper. Oven: Pre-heat oven to 350 degrees. Place duck breasts on a lined baking tray or dish, skin side up. Bake for 10-12 minutes. Grill: Pre-heat grill on a medium high heat. Place duck breasts on a lined baking tray, turning duck frequently under grill for 8-10 minutes. Thinly slice the breasts and arrange in a fan on the plates. Pour a line of sauce and cherries crosswise over the slices. Serve. Note: Compote may be made the day before and reheated before plating the duck. 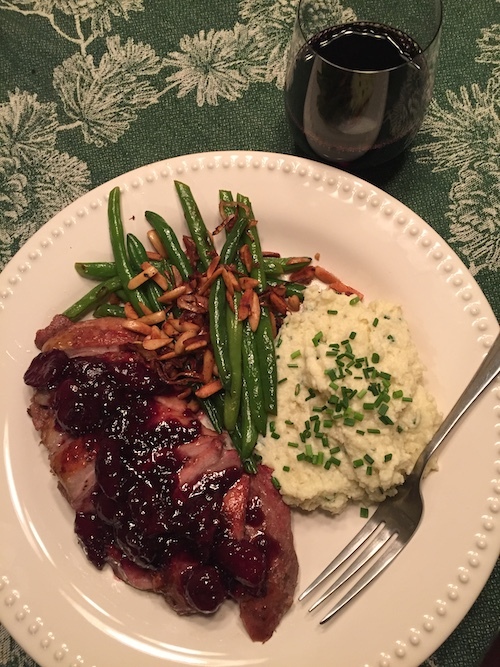 This entry was posted in Low Carb, Poultry, Sauces & Dressings on November 17, 2018 by Blackberry Season.